If you didn’t hear the news, my first baby Madison is starting school next year! I can’t believe it! I’m so proud of her and she’s so excited, but I’m sure other Mums out there can relate to the stress that we go through when we send them off to big school for the first time. I am such a worry wart about how she’ll go with eating at school. Will she leave her food? Is there enough variety? Is there enough space in her lunch box? Believe me – you name it, I’ve worried about it haha. So, I’ve been practicing. Yep, nothing like a trial run, Mums. On the days she’s home at the moment, I make her different foods in a lunch box to see what works and doesn’t. You never really know what’s going to travel well and what’s going to end up all mushy by lunchtime! We have recently been given the chance to try Smash’s newest lunch box, the Bento Bite Kit. We gave this a test drive on one of our practice lunches, and here’s what we thought. - Snack pot. This little snack pot is perfect for yogurts, sauces and is leak proof – yay, no evenings spent trying to get strawberry yoghurt out of the school bag! - There’s an ice brick! Keeps lunches fresher for longer, perfect for hot Sydney summers. - The outside of the pack gives you lunch ideas – a lifesaver for Mums on the run! - Sealed lid – no more leaking! - Easy child friendly latch – no trapped fingers! It comes with a matching drink bottle and Madison loves the glitter look inside it – she’s such a glitter princess! It’s reassuring for me as a Mum that everything is BPA-free, too. No chemicals, thank you! 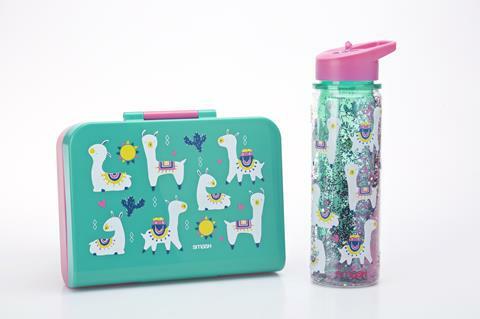 If you’re looking for a new cute lunch box, check these out. Available at Woolworths from 15th December 2018‬, available only while stocks last.